A lot of history and some tidbits. 1942 - Battle of Savo Island begins; First of many sea battles near Guadalcanal. A Japanese force runs through the Allied forces guarding Savo Sound, sinking three American heavy cruisers, USS Quincy (CA 39), USS Vincennes (CA 44), and USS Astoria (CA 34), along with other damaged Allied vessels. As a result of the loss, the sound gains the nickname, Iron Bottom Sound. 1942: A Japanese force runs through the Allied forces guarding Savo Sound, sinking three American heavy cruisers, USS Quincy (CA 39), USS Vincennes (CA 44), and USS Astoria (CA 34), along with other damaged Allied vessels. As a result of the loss, the sound gains the nickname, Iron Bottom Sound. Alvin York's Action to a Pillar of Purple Fire by W. Thomas Smith Jr.
Aug. 8, 1918: Cpl. (future Sgt.) Alvin York captures "the whole damned German Army" – actually 132 German soldiers – in an action for which he will receive the Medal of Honor. The bomb, code-named Fat Man, detonates approximately 1,840 feet above Nagasaki between the city's two Mitsubishi plants. "A tremendous blast wave struck our ship and made it tremble from nose to tail. This was followed by four more blasts in rapid succession, each resounding like the boom of cannon fire hitting our plane from all directions. "Observers in the tail of our ship saw a giant ball of fire rise as though from the bowels of the earth, belching forth enormous white smoke rings. Next they saw a giant pillar of purple fire, 10,000 feet high, shooting skyward with enormous speed." Spain basically caves, relinquishing "all claim of sovereignty over and title to Cuba." Puerto Rico and other Spanish-held islands in the West Indies are ceded to the U.S.
About 5,000 U.S. Sailors lost their lives in the waters around the island of Guadalcanal between 7 August 1942 and February 1943 defending the U.S. Marines occupying the island from Japanese counter-attack, in the first U.S. offensive of World War II. The U.S. Marines paid dearly to hold the island as well; 1,152 Marines were killed on the island, along with an additional 446 Army troops who arrived later in the campaign. The Japanese surface navy did not get the memo that the tide of war had turned at the Battle of Midway (actually, literally, because the Japanese kept their losses at Midway a secret from almost everyone who didn't see it first hand.) Not realizing they were supposed to be losing, the Japanese Navy repeatedly went on the attack, and for much of the campaign held the initiative. The result was seven brutal major naval battles and numerous lesser ones, including two carrier vs. carrier battles on the scale of Coral Sea, and five ferocious and incredibly costly night surface actions. The price for defending Guadalcanal paid by the U.S. Navy was two aircraft carriers (USS Wasp (CV-7) and USS Hornet (CV-8)), five heavy cruisers (plus an Australian heavy cruiser and 84 of her crew), two light cruisers and 15 destroyers sunk and numerous other ships of all types heavily damaged. The Japanese lost an approximately equal number of combatants (including two battleships and a light carrier) along with numerous transports with thousands of troops. So many ships were sunk in the sound between Guadalcanal and Tulagi that it became known as "Ironbottom Sound." The U.S. Navy and Marines lost over 400 aircraft in the campaign, and the Japanese lost somewhat more (figures vary.) It was in the skies around Guadalcanal (not at Midway as commonly believed) that the cream of Japanese naval aviation was finally lost, particularly under the guns of vastly improved U.S. shipboard anti-aircraft fire. The Japanese Navy fought with extreme tenacity, skill and determination, and the naval battles around Guadalcanal were bookended with two of the worst defeats in U.S. naval history (Savo Island and Tassafaronga,) eclipsed only by Pearl Harbor. The battles in between were all narrow wins or losses for either side, all with substantial casualties. In the first night battle of Guadalcanal (13 Nov 42) a force of U.S. cruisers and destroyers sacrificed itself to prevent a second Japanese battleship bombardment of Guadalcanal (the first had killed 40 Marines and destroyed or damaged over half the 90 U.S. aircraft on the island) at a cost of over 1400 Sailors, including two admirals, and all five Sullivan brothers. For much of the campaign, the Japanese Navy owned the night, while U.S. aircraft from carriers and Henderson Field on Guadalcanal owned the day. Attempts by either side to challenge the other's strength usually resulted in heavy losses. Throughout the campaign the Imperial Japanese Navy fought with great valor and gave as good as it got, frequently to the surprise of U.S. forces, which also invariably fought with great courage. But despite severe losses, in the end it was the U.S. Navy that remained on the field, while the Japanese withdrew. The difference was that the U.S. could replace the losses in ships and aircraft, but the Japanese could not. At dawn on 7 Aug 42, the U.S. Navy landed Marines on Guadalcanal, Tulagi and a couple smaller islands at the southern end of the Solomon Island chain. Shortly after midnight on 8-9 Aug, the Japanese counter-attack came. An eight-ship (five heavy cruisers, two light cruisers, and a destroyer) Japanese force slipped undetected past two radar-equipped U.S. destroyers and attacked two groups of Allied heavy cruisers and destroyers guarding the western approaches to the U.S. invasion force, which was still hectically engaged in landing supplies to support the Marines ashore. When it was over, four allied heavy cruisers were sunk (USS Astoria (CA-34,) USS Quincy (CA-39,) USS Vincennes (CA-44), and HMAS Canberra (D-33,)) the heavy cruiser USS Chicago (CA-29) and a couple destroyers damaged, and 1,077 Allied Sailors killed, in what CNO ADM Ernest J. King would describe as the "blackest day of the war." Pearl Harbor was one thing, but to have suffered such a severe one-sided loss by a force whose very purpose was to guard against such an attack, was a severe psychological blow. Immediately upon being informed that U.S. forces were landing at Guadalcanal and Tulagi in the southern Solomon Islands on the morning of 7 Aug 42, Japanese Navy commanders on various missions in the vicinity of the Bismarck Sea (at the northern end of the 500 mile long Solomon Island chain) aborted their planned tasks, without awaiting orders, and congregated at the major Japanese base at Rabaul in anticipation of going on the attack. Meanwhile, the Japanese Army headquarters at Rabaul, focused on their overland campaign in New Guinea to capture Port Moresby, dismissed the landings as nothing to worry about. Based on their intelligence, the Japanese were anticipating a U.S. operation in the southern Solomon Islands (where the Japanese had just commenced construction of an airfield on the north coast of Guadalcanal) and were aware that a large U.S. and Allied force was gathering in the southern Pacific, northeast of Australia. However, they did not anticipate it so soon. The exact timing, and scale, of "Operation Watchtower" caught the Japanese completely by surprise. The 80-plus ships of the U.S. invasion force, including three aircraft carriers (USS Saratoga (CV-3,) USS Enterprise (CV-6,) and USS Wasp (CV-7,)) met no initial opposition at dawn on 7 Aug. Japanese troops on Guadalcanal, mostly construction laborers, fled into the jungle, although a small garrison force of Japanese Naval Infantry across the sound on Tulagi and small neighboring islands put up intense resistance that took some time to root out. Nevertheless, Japanese naval aviation units at Rabaul mounted two major attacks on 7 Aug and a third on 8 Aug, which interrupted the landing of supplies on Guadalcanal as the U.S. ships, forewarned of the incoming Japanese airstrikes by the "Coast-watcher" network (consisting mostly Australian and European expatriate plantation owners who had taken to the jungle, with a radio, on various islands along the Solomon chain) dispersed into defensive formations, that proved highly effective. Although about half the U.S. Navy fighters that opposed the Japanese strikes were shot down (about 20,) the Japanese bombers suffered severe losses and inflicted minimal damage, although they claimed many U.S. ships sunk (The Commander of the 5th Air Attack Force claimed two heavy cruisers, one cruiser, two destroyers and nine transports sunk. The reality was serious damage to the destroyer USS Jarvis (DD-393) and the transport USS George F. Elliot (AP-13), which would have to be scuttled.) Nevertheless, the constant threat of air and submarine attack kept the U.S. ships at Condition One for almost 48 hours straight, which in conjunction with the extremely hot and humid conditions, left U.S. Navy crews exhausted by sundown on 8 August. Operation Watchtower, the first U.S. offensive of World War II, was championed by CNO ADM Ernest J. King, as a means to take the initiative following the U.S. Navy victory at Midway. Although King supported the agreed Allied "Defeat Germany First" strategy, King believed that an increase in apportionment of resources to the Pacific over that currently planned was necessary, and going on the offensive in the Solomon Islands was a means to force that. King's approach was opposed by General Douglas MacArthur (Commander of the Southwest Pacific) and many other commanders on the grounds that it was premature, and U.S. forces in the region did not have the necessary numbers, capability, training, or logistics base to go on the offensive yet. Despite intense opposition, King prevailed in the newly created Joint Chiefs of Staff, and the operation was ordered to go forward despite clearly recognized resource challenges. To make a long story short, an area was carved out of MacArthur's Southwest Pacific Region and ADM Nimitz' Pacific Region, and designated the South Pacific Region (COMSOPAC,) under the Command of VADM Robert L. Ghormley. Ghormley ostensibly reported to Nimitz, but King exercised very direct, and frequently heavy-handed, direction throughout the Guadalcanal campaign. The pre-invasion planning conference between the U.S. commanders leading the operation was one of the most bitter and acrimonious of the entire war. The naval amphibious force (CTF62) would be commanded by VADM Richmond K. Turner, and the supporting carrier force (CTF61) by VADM Frank Jack Fletcher (who had been in command at Coral Sea and Midway.) The two immediately clashed over Fletcher's refusal to commit to keeping his carriers in the vicinity of Guadalcanal for any more than 48 hours, out of concern that doing so would leave the carriers vulnerable to Japanese land-based air and submarine attack. Departing so soon, however, would leave Turner's supply ships and transports without air cover before they could complete unloading, which could leave the Marines ashore, under the command of MGEN Vandegrift, potentially vulnerable to Japanese counter-attack. Turner literally accused Fletcher of cowardice, and Vandegrift tried to stay out of the frag pattern. The fact that Ghormley did not attend the conference (he sent a staff officer) and did not adjudicate the dispute has been heavily criticized by historians (and other commanders at the time.) For his part, Vandegrift had serious concerns about the Navy's ability to get adequate supplies ashore to sustain his force. U.S. Naval Intelligence had reasonably accurately determined the number of Japanese cruisers operating in the general vicinity of Rabaul, but was unable to detect Mikawa's actual departure. As Mikawa's force commenced its transit down the northern Solomons, it was sighted by the U.S. submarine S-38, a U.S. Army Air Force B-17, and two Australian Air Force Hudson bombers, all of which were subordinate to MacArthur's Southwest Pacific region, and none of which were aware a U.S. landing was going on in the southern Solomons. Here the seam between the Southwest Pacific Region and South Pacific Region had major impact due to convoluted communications routing paths that resulted in contact reports originating in the northern Solomons taking over ten hours on average to reach Turner's forces off Guadalcanal, when they reached them at all. Those that did get through had conflicting courses (Mikawa would change course whenever reconnaissance aircraft were sighted, to throw them off) as well as inaccurate reporting of ship types. The report that reached Turner around sunset on 8 Aug, stated the force included two "seaplane tenders or patrol boats" an ambiguous (and contradictory) recognition of ship type, which was not viewed as an immediate threat. Turner had also requested that U.S. Navy PBY patrol planes fly reconnaissance missions on the 8th over the central Solomons, but due to weather conditions at launch, the missions were scrubbed, but Turner's force was not informed of the cancellation. The U.S. cruisers supporting the landing were not ordered to launch any of their own scout aircraft due to concern that the recovery of float planes would make the ship vulnerable to Japanese submarine attack (although there were no Japanese submarines in the area at the time, the U.S. did not know that.) As a result, Mikawa's force completed the vulnerable daylight portions of its transit without being accurately identified or its intentions assessed. As a result, as of sundown on 8 Aug, the U.S. cruisers supporting the landing were disposed to guard against a night surface attack, but none of the U.S. Navy commanders off Guadalcanal were expecting one. On the night of 8-9 August, Turner divided his cruisers into three groups to protect the three approaches to the landing area. To the east, covering Sealark Channel (considered the least likely avenue of enemy approach) were the light cruisers USS San Juan (CL-54) and HMAS Hobart. To the west, RADM Victor A. C. Crutchley, RN (Royal Navy,) embarked on the Australian heavy cruiser HMAS Australia, divided his force to cover the two western approaches, bisected by Savo Island. Covering southeast of Savo island were the heavy cruisers, HMAS Australia, HMAS Canberra (D-33,) and USS Chicago (CA-29) and two U.S. destroyers, USS Patterson (DD-392) and USS Bagley (DD-386) (referred to as the "Southern Group".) Covering northeast of Savo Island were the heavy cruisers USS Vincennes (CA-44,) USS Quincey (CA-39,) and USS Astoria (CA-44,) and two U.S. destroyers, USS Helm (DD-388) and USS Wilson (DD-408) (referred to as the "Northern Group.") Two SC radar-equipped U.S. destroyers were stationed west of Savo Island, the USS Ralph Talbot (DD-390) to the north and the USS Blue (DD-387) to the south, to provide radar warning of any approaching Japanese force. Just before sunset, Turner called for a conference of his senior commanders on board his flagship, USS McCawley (APA-4,) upon learning that Fletcher's carriers were departing several hours earlier than planned, due to what Fletcher said was refueling concern as well as significant loss of fighter aircraft in the first two days of the operation. With the impending loss of air cover, Turner decided that U.S. ships would withdraw, beginning at dawn on 9 Aug, over the objection of Vandegrift, since many of the supplies had yet to be offloaded. (The art of "combat loading" and logistics-over-the-beach were still very much in a learning phase, resulting in a pile up of supplies on the beach and a backlog of boats trying to reach the beach; a situation of significant chaos and confusion resulting in mutual recriminations among Navy and Marine Corps.) The landing of supplies continued throughout the night. Although Turner relented and decided to allow the supply ships and transports to remain for an additional day (9 Aug) the surface combatants would pull out the morning of 9 Aug. Like the pre-operation conference, this contentious meeting aboard Turner's flagship, impacted U.S. Navy and Marine relations for decades. RADM Crutchley had steamed over to the meeting in his flagship, HMAS Australia, but after the meeting opted not to sail in the darkness through the poorly charted waters to resume station southeast of Savo Island. He neglected to tell anyone that he would not return that night. As a result, tactical command of the Southern Group fell to Captain Howard Bode, CO of Chicago, which was in trail behind HMAS Canberra. Bode had previously been CO of the battleship USS Oklahoma (BB-37) but not aboard when she was sunk at Pearl Harbor. The Northern Group was under the command of the CO of the Vincennes, CAPT Frederick Riefkhol. The cruisers had all gone to Condition Two after sunset, and of the five heavy cruiser skippers, Bode was the only one awake after midnight, however Bode had also ordered Chicago's surface search radar turned off out of concern it would give away her position. Mikawa made the night part of his transit at 24 kts, intent on steaming to the south of Savo Island, attacking the U.S. ships off Guadalcanal, then those off Tulagi, and then exiting to the north of Savo Island, to be 150 or so miles up the Solomons at daybreak. Mikawa had catapulted several of his cruiser float-plane to scout the area. Although the flights aroused suspicion, darkness precluded positive identification, and at least one of the float planes brazenly showed its running lights and was therefore presumed "friendly" by some of the U.S. ships that spotted it. No one deduced that the presence of single-engine aircraft at night was an indicator of imminent attack. As Mikawa's force approached from west of Savo Island, Japanese lookouts sighted the pickets USS Blue at about 0044 and the USS Ralph Talbot shortly after. Mikawa slowed to minimize wake, guns trained to blast either ship at any sign of detection or alarm. However, neither ship detected the Japanese either by sight or by radar. The SC radars on the ships had an effective detection range of 4-10 miles, and at the time the two U.S. destroyers were 14 NM apart on opening courses. The eight Japanese ships shot the gap unseen. Shortly before 0130, Japanese lookouts sighted the Southern Group of U.S. cruisers, which were dimly backlit by a distant fire on one the U.S. transports off Guadalcanal, hit in an earlier air attack. In keeping with standard Japanese night attack doctrine, Mikawa held gunfire until well after the Japanese launched torpedoes. 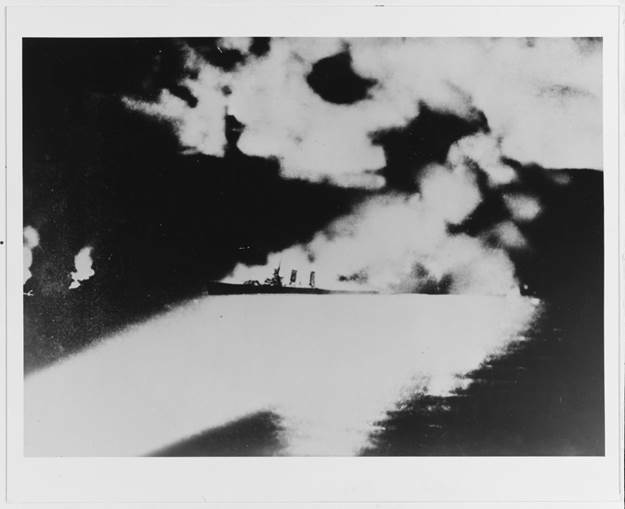 Shortly before expected torpedo impact, Japanese float planes dropped flares backlighting the Southern Group, and Mikawa opened fire. U.S. lookouts had been hampered by lightning flashes from nearby rain squalls, but in response to what were Mikawa's initial gun flashes, the USS Patterson (CDR Frank Walker, commanding) issued a voice broadcast at 0145 via TBS (Talk-between Ships,) "Warning, warning, strange ships entering harbor." TBS had been clobbered with administrative traffic most of the night (not its intended purpose) and a few ships received the warning, ambiguous as it was, but many did not. Regardless, the Japanese torpedoes and shells were already on the way. Although Canberra's radar failed to detect the Japanese, her lookouts sighted the inbound torpedoes and she managed to avoid them. However she was then hit by almost 30 shells in two minutes, killing her CO, CAPT Frank E. Getting and other senior officers, and putting her effectively out of action for the remainder of the battle. The Chicago was hit in the bow by a Japanese torpedo from the Kako and hit amidships starboard by a second Japanese torpedo that failed to explode, as well as a shell that hit a leg of the forward tripod mast, killing two and wounding the XO. Of some 44 starshells fired by the Chicago, all but six failed. Captain Bode ordered his ship on a westerly course toward what he thought would be the main battle, but which took him in the opposite direction; Chicago's main battery never fired, although she did hit the Japanese light cruiser Tenryu with a 5" round, killing 23. However, Bode neglected to radio a warning to anyone, for which he was censured as a result of the post-battle investigation. The Bagley fired a spread of torpedoes, at least one of which possibly hit the Canberra; none hit the Japanese. The skipper of Patterson also ordered a spread of torpedoes, but his own guns drowned out the order, and he only discovered later that the torpedoes had not been launched. As the southern battle developed, the destroyer USS Jarvis (DD-393)(CDR William W. Graham, Jr., commanding) blundered through the area. Hit by a torpedo while valiantly interposing herself between the Vincennes and an inbound torpedo bomber in an earlier air attack, the Jarvis had a 50 ft. gash in her hull. Through a communications foul-up, she departed the Tulagi area in the middle of the night en route Australia with no tug to support. The Japanese destroyer Yunagi, at the tail of the Japanese column, peeled off to go after the Jarvis. What happened next is not known for sure, but Jarvis appears to have successfully defended herself and Yunagi broke off, now separated from the rest of the Japanese force. The next day, Jarvis was attacked by 31 Japanese bombers, who mistook her for a cruiser, and she was lost with all 233 hands. The action with the Southern Group lasted only about 10 minutes before Mikawa headed for the Northern Group. Lookouts and bridge watches on the U.S. cruisers saw the southern action but assessed it incorrectly as shore bombardment, depth charges on submarines, or a friendly-fire incident, everything except what it actually was. The radar operator on the Astoria detected and reported the incoming Japanese force, but was overruled by the OOD who insisted the contacts had to be interference from Savo island itself. Debate raged on a couple ships whether to wake the captain, when finally the searchlight from Chokai ended the discussion. The Japanese too fell into disarray after the battle with the Southern Group, and inadvertently split into two groups (three, counting Yunagi) which by chance caught the Northern Group in between, taking the U.S. cruisers under fire from opposite directions, but also risking fratricide with their own ships. The U.S. ships began to return fire, but the Japanese had several salvos jump. As the U.S. began to find the range, the Japanese began to score hits. On board Astoria, the gunnery officer ordered commence firing before the captain reached the bridge, which upon arriving, CAPT William Greenman first ordered his ship to cease-fire, more concerned that he was engaged in a "friendly fire" accident before continuing incoming fire convinced him otherwise. CAPT Riefkohl on Vincennes also tried signaling the Japanese, thinking he had blundered into an accidental engagement with the Southern Group. On two of the U.S. cruisers (Quincy and Vincennes,) the watchbill was written in a way that the main battery could not be fired in Condition Two, since key personnel were in the wrong place, and the rapid setting of "zebra" (then "zed") hampered getting to Condition One. Quincy, recently arrived from the Atlantic with no battle experience, went to General Quarters on receipt of Patterson's initial warning, but took almost 12 minutes to get to Condition One, which was already too late. Nevertheless, the Quincy attempted to charge the Japanese line before a couple torpedoes from the Tenryu and a direct hit on the bridge, killing CAPT Samuel N. Moore, put an end to that. A few early U.S. rounds found their mark, before the deluge of Japanese shellfire put most U.S. guns out of action. The Japanese heavy cruiser Aoba took a hit in her torpedo bank, but having already fired 13 of her 16 torpedoes, the effect was not the catastrophe it could have been. The Quincy put a shell into Chokai's chart room, missing Mikawa and his staff by a few feet (although losing his navigation capability was one of several reasons Mikawa would break off the attack.) Chokai's aviation section amidships also went up in flames as a result of this hit (Japanese cruisers had the same design flaw) but it was too late for any U.S. ships to take advantage. In going after the Northern Group, Mikawa missed his chance to attack the U.S. transports and supply ships. Mikawa reasoned that by the time he regrouped his forces and commenced an attack on the transports it would be approaching dawn, and there would be no way he could get very far away before being attacked by U.S. carrier aircraft. Mikawa did not know that the U.S. carriers were already opening the distance to the east. Although Mikawa's own scout aircraft had provided a reasonably accurate reporting of U.S. force disposition off Guadalcanal, Mikawa had also been deceived by the wildly inflated claims of loss and damage to the U.S. force resulting from the earlier air attacks. Mikawa had done exactly what his years' of training and Japanese doctrine required him to do, seek out and achieve a decisive victory against enemy combatants. The transports could be dealt with by air attack, and the Japanese Army had assured him that the U.S. forces on Guadalcanal could be booted off whenever the Army decided to get around to it. Nevertheless, Mikawa would be heavily criticized (later) for his failure to sink the U.S. transports, including by some who initially considered his plan foolhardy. As the Japanese force exited the area north of Savo Island, it encountered the destroyer Ralph Talbot, which took several hits before a fortuitous rain squall prevented her demise. The Quincy and Vincennes went down shortly after the Japanese departed (0238 and 0250 respectively.) Attempts to save the Astoria continued until early afternoon of 9 Aug until she finally sank. The heavily damaged Canberra appeared to be in no immediate danger of sinking, but Turner ordered that if she could not be removed from the battle area by 0630 she was to be scuttled (but Astoria received no such order for some reason.) As the Chicago returned from her futile foray to the west, she engaged in a brief exchange of friendly-fire with the Patterson, which was standing by the Canberra, fortunately with no hits. When it came time to scuttle the Canberra, four torpedoes and 263 rounds of 5" gunfire from USS Selfridge (DD-357) failed to do so. Finally, additional torpedoes from USS Ellet (DD-398) put the stubborn ship under. Canberra lost 84 of her 819 crew. (The U.S. would subsequently name a new Baltimore-class heavy cruiser the USS Canberra (CA-70) at the direction of President Roosevelt.) As the day went on, the Marines ashore would watch as the U.S. Navy headed over the horizon, leaving them alone. As the Japanese cruisers returned to port Kavieng on New Ireland, the old U.S. submarine S-44 (LCDR J. R. Moore, commanding) got off a salvo of torpedoes. Apparently using older Mk 10 torpedoes was a blessing, because unlike other U.S. submarines that were encountering repeated torpedo failures, three of the four torpedoes fired by S-44 hit the Japanese heavy cruiser Kako, and actually detonated, sending her to the bottom with 34 of her crew. This was the first major Japanese combatant to be sunk by a U.S. submarine in the war. S-44 would be sunk off the Kurile Islands in Sep 43 with all but two of her crew. The disaster at Savo Island was a profound shock all the way up the chain of command to President Roosevelt, and a huge embarrassment to Navy leadership. With the loss of over a thousand Sailors, it is considered the worst wartime defeat in U.S. naval history, since technically the U.S. was not formally at war for Pearl Harbor. CNO King directed that details of the battle be withheld from the public, casualty notification substantially delayed, and wartime censorship enabled him to do so. Many of the details remained wrapped in secrecy even many years after the war. The board of inquiry found lots of blame to go around, but no one in particular to pin it on. The only officer to receive formal censure was Captain Bode of the Chicago, and he killed himself before it was officially delivered. Captain Riefkol, commander of Vincennes and the Northern Group of cruisers, was not censured, but never held command at sea again. RADM Mikawa would later express considerable respect for the bravery shown by the Northern Group of U.S. cruisers, believing that had the U.S. ships had only a few more minutes warning, the outcome of the battle might have been very different. Mikawa's admiration notwithstanding, the outcome probably would still have been bad for the U.S. Navy, and the post-war Naval War College study of the battle concluded that "valor alone was insufficient." For most of the interwar years the U.S. approach to night combat was to avoid it. The Japanese approach to night combat was to seek it. In the series of vicious night battles that would follow, the U.S. Navy would pay dearly in the waters of Ironbottom Sound. List of Naval War College Lessons Learned (the actual lessons are somewhat meaty, this is just the titles from the index.) Some of these may sound like, "duh!" today, but over 1,000 Sailors paid with their lives for the Navy to learn (or re-learn) them. Tactical Voice Radio Discipline Should be Maintained. The inimitable singer Glen Campbell passed away today after a long struggle with Alzheimer's disease. He was diagnosed in late 2010 but with the tireless care of his wife Kim, continued to perform and even filmed a fifteen-month farewell tour that followed the pernicious advance of the disease. As with many sufferers of Alzheimer's, his knowledge and facility with music lasted longer than his memories of people, places or things. Even after the lyrics to the songs he had sung thousands of times were lost to him, he could still play them. He could still read the lyrics on a teleprompter. The man was perhaps the finest guitarist of his time, a fact unknown to his millions of fans who loved his voice and songs. Before Campbell became a star in his own right, he had sung and played guitar on the records of countless other groups and soloists the 1960s and '70s: The Beach Boys, Sagittarius, Ricky Nelson, Baby Darin, Frank Sinatra, Tony Bennett, etc. It is a long list of greats. What many people do not know is that he did not read music but had an auditory eidetic memory. He would and could hear a song once and know every word, note and chord. In studio sessions when every other musician was reading the music for the first time, he was listening. After one pass, he would know the song and what he was to do with it. His vocal range went from a Russian bass C to a Pavorotti D in a natural voice, no falsetto. He was a very rare talent. His first real hit was Gentle on My Mind in 1967. He began performing around Los Angeles with a four-man country band. After that came a long string of hits, most of them written by Jimmy Webb. Many of them remain standards to this day. Beginning in 1969 he toured the country and later the world, now with full orchestras. From 1969 to 1972 he starred in his own television variety program, The Glen Campbell Goodtime Hour. Guests on the show ranged from Ray Charles to Tony Bennett. He first performed at Carnegie hall in March 1973. (Buck Owens was the first country singer to perform there in 1966.) He co-starred with John Wayne in the film True Grit for which Wayne won an Academy Award. He worked several times a year in Las Vegas to sellout crowds and continued to perform concerts up until the Alzheimer's forced him to stop. There was of course a dark side to his meteoric rise. For a long time Glen was "the only singer to have the 'Good Housekeeping seal of approval,'" a standard line in his concerts, and one he deserved. He smoked but rarely drank but did succumb to the drug culture that took hold of so many celebrities in the 1970s. At the time, the infatuation with cocaine and amphetamines was accompanied by the silly notion that those drugs were not addictive. But they were. Several of the celebrities who introduced Campbell to that scene died long ago at early ages. Glen prevailed but perhaps he eventually paid the price. Much of today's music is without melody or coherent lyrics. Young people seem not to know the meaning of the word "melody." Campbell's songs were all melodious. His voice and his brilliance on the guitar were unparalleled. Roy Clark, a gifted guitarist in his own right, once said when a fan said "You're the best guitarist...", Clark replied that, "No, that would be Glen Campbell." They worked together often; Clark knew what he was talking about. For those who worked with him and for him, working with lesser musicians would always be something of a chore by comparison. Glen will be missed but his music will live on and may yet be discovered by the youth of a new generation that finds they like memorable melodies and songs that are stories. Rest in Peace, Glen Campbell. Item Number:2 Date: 08/09/2017 CHINA - LIVE-FIRE DRILLS WRAP UP NEAR KOREAN PENINSULA (AUG 09/SCMP) SOUTH CHINA MORNING POST -- The Chinese navy has just concluded four days of live-fire naval exercises off the Korean peninsula, reports the South China Morning Post. The training, which concluded on Tuesday, covered offensive and defense maneuvers with surface ships, submarines, air support and coast guard forces, according to the state-run CCTV television station. The maneuvers were designed to simulate real combat conditions and test tactical, combat and weapons training, said the Defense Ministry, as cited by the Diplomat (Tokyo). Aerial interception and amphibious assaults were reportedly part of the drills. The training took place in the waters between the coast of Qingdao in Shandong province and Lianyungang in adjacent Jiangsu province, according to the navy. Many observers have suggested the drills were a response to North Korea's ballistic missile test on July 28. An expert in Singapore maintained that the actions were aimed at deterring others in the region, including the U.S. Item Number:3 Date: 08/09/2017 EGYPT - MILITARY DESTROYS MILITANT BUNKER, KILLING 5, IN SINAI (AUG 09/AHRAM) AHRAM ONLINE -- The Egyptian army, in cooperation with the air force, say their personnel killed five militants during an operation in Central Sinai on Tuesday, reports Ahram Online (Egypt). The ground and air forces destroyed an underground hideout, said a military spokesman. Soldiers also arrested three other militants and seized a van carrying narcotics, the spokesman said. Separately, on Wednesday, gunmen opened fire at a police patrol vehicle in the northern Sinai city of El-Arish, killing four officers, reported state newspaper Al-Ahram. A hunt is underway for the attackers, said the paper. Item Number:6 Date: 08/09/2017 ISRAEL - FOUND VULNERABLE TO HACKING BY U.S., USE CHINESE-MADE DRONES WILL STILL SERVE WITH IDF (AUG 09/JP) JERUSALEM POST -- The Israeli army says the service will continue to use Chinese-made DJI consumer drones despite a recent U.S. Army order halting their use, because of their risks, reports the Jerusalem Post. Israeli army infantry brigades stationed in the West Bank and border defense combat battalions are scheduled to receive hundreds of Mavic and Matrice drones as part of a project to improve the capabilities of the units. The IDF said earlier this year that by the end of 2017 every infantry, border defense and combat intelligence corps commander would be provided with the camera-equipped, collapsible drones, noted the Times of Israel. The drones will be a "central part of the border defense operations," according to a military statement. Deliveries are scheduled this month, with training well underway. "The IDF takes into account the limitations of the said multirotor drones, and will use them accordingly for unclassified missions," the statement said. The military "is working to develop and acquire multirotor drones without these restrictions." Lt. Gen. Joseph Anderson, the U.S. Army deputy chief of staff for plans and operations, recently ordered that all troops should "cease all use, uninstall all DJI applications, remove all batteries/storage media from devices, and secure equipment for follow on direction." A probe by the U.S. Army Research Lab and U.S. Navy found that DJI products could be easily compromised by third parties, said the directive. The civil Mavic and Matrice drones are considered an interim solution until military air vehicles are acquired, a senior IDF official told the Jerusalem Post. Item Number:7 Date: 08/09/2017 JAPAN - DEFENSE MINISTER DOES NOT DISMISS POSSIBILITY OF ACQUIRING CAPABILITY TO HIT N. KOREAN MISSILE BASES (AUG 09/JT) JAPAN TIMES -- New Defense Minister Itsunori Onodera says he is willing to consider permitting the Japan Self-Defense Forces to acquire the ability to directly attack North Korean missile bases, reports the Japan Times. Responding to questioning, Onodera told reporters on Aug. 4: "We should consider it from the perspective of what Japan can do to beef up the deterrent capability of the Japan-U.S. alliance and protect the lives and property of the Japanese people." During the joint interview, he also emphasized that he would facilitate debate on how to improve "Japan's overall ability to deal with ballistic missiles" from North Korea. Belligerent acts are prohibited by the Japanese constitution. On Sunday, Prime Minister Shinzo Abe said that he had "no plan" to give the SDF the authority to develop such offensive capabilities. The Japanese government has long maintained that counterattacks are theoretically acceptable under the supreme law. Still, acquiring this capability would be a major break with Japan's pacifist postwar policies. Tokyo will continue to cooperate closely with Washington and Seoul to rein in North Korean provocations while also asking China and Russia to play larger roles in pressuring the regime in Pyongyang, said Onodera. Item Number:13 Date: 08/09/2017 SOUTH SUDAN - 1 YEAR AFTER AUTHORIZATION, REGIONAL PROTECTION FORCE BEGINS PHASED DEPLOYMENT (AUG 09/UNNS) UNITED NATIONS NEWS SERVICE -- A United Nations-authorized regional force has begun deploying in South Sudan, reports the U.N. News Service. The arrival, announced Tuesday, has been awaited for some time, coming a year after the Security Council decided on the deployment, noted AFP. The additional forces will allow the existing peacekeepers to extend their presence to conflict areas beyond Juba, the capital. "Having additional troops means we can carry out more tasks related to our mandate, to protect civilians and build durable peace," David Shearer, the Secretary-General's special representative and head of the U.N. Mission in South Sudan (UNMISS), told reporters on Tuesday. The 4,000-strong regional protection force, authorized by the U.N. in August 2016, will protect key facilities in Juba and the main routes into and out of the city, according to UNMISS. It will also enhance protection for civilian sites and other U.N. facilities, said a release from the world body. The arrival of the first company of Rwandan troops, in addition to a Nepalese high readiness company and more than 100 Bangladeshi engineers in the mission area marks the start of the phased deployment of the regional force, said Shearer. The regional force will be under the command of UNMISS, he said. Item Number:16 Date: 08/09/2017 USA - FOLLOWING 3-MONTH DEPLOYMENT OFF KOREA, AUSTRALIA, RONALD REAGAN CARRIER IS HOME IN YOKOSUKA (AUG 09/S&S) STARS AND STRIPES -- The USS Ronald Reagan aircraft carrier has returned to its homeport in Yokosuka, Japan, after a three-month deployment, reports the Stars and Stripes. The carrier pulled into Yokosuka Naval Base on Tuesday, according to a Navy statement. The Reagan left the base on May 17 for operations off the Korean Peninsula alongside the USS Carl Vinson carrier strike group and Japanese forces. The carrier took part last month in the biennial Talisman Saber exercise with Australia. Item Number:18 Date: 08/09/2017 USA - MORE THAN 1,000 CHIEFS FACE INVOLUNTARY SEA DUTY (AUG 09/NTIMES) NAVY TIMES -- The U.S. Navy may order as many as 1,100 senior enlisted personnel back to sea duty involuntarily to fill gaps at sea and in deploying operational units, reports the Navy Times. The service announced the controversial policy on Monday. It took effect immediately, seeking to fill nearly 3,000 senior enlisted billets at sea. About 2,080 of the empty billets are at the E-7 level. Around 700 are for senior chiefs and nearly 2000 are for master chiefs. Several months ago, the Navy sought to fill junior enlisted billets at sea and launched a program encouraging enlisted sailors to voluntarily extend on sea duty. Adding to the service's problems with senior enlisted personnel is the fact that 25 ratings ashore are overmanned. The bulk of those being sent back to sea will likely come from these ratings, said Navy personnel officials. Item Number:20 Date: 08/09/2017 YEMEN - 10 DEAD AS AQAP ATTEMPTS TO STORM ARMY CAMP IN ABYAN PROVINCE (AUG 09/REU) REUTERS -- There were heavy casualties after Al-Qaida militants attacked an army camp in southern Yemen on Tuesday, says a security source cited by Reuters. Suicide bombers and gunmen attempted to storm the camp in Juhayn in Abyan province, said the official. Four soldiers and six suspected Al-Qaida in the Arabian Peninsula (AQAP) militants were killed, said local officials. Ten other soldiers were wounded.